Ogunquit is a cozy, southern Maine village, nestled around sandy beaches and Maine's beautiful rocky shoreline. Ogunquit offers one of the finest sandy beaches anywhere, a picturesque area of rocky coastline, outstanding restaurants, great shopping, art galleries, summer theater and much more. Just across the famous footbridge is Perkins Cove, a quaint working harbor that has been popular with artists from around the world for nearly 100 years. Today Perkins Cove is a delightful mix of shops, galleries, restaurants, and homeport for many fishermen. The Cove also serves as the departure point for charter fishing boats, sight-seeing cruises, and whale watching expeditions. Just a brief amble from your room, the Ogunquit Museum of American Art is one of Ogunquit’s hidden treasures. Dedicated to contemporary American art, the museum is both a showcase for today’s artists and a repository for the works of many members of Ogunquit’s famous art colony. Characterized as “the most beautiful little museum in the world” by Francis Henry Taylor, former director of the Metropolitan Museum of Art. The museum’s location, overlooking the mouth of Perkins Cove, continues to delight visitors each year. 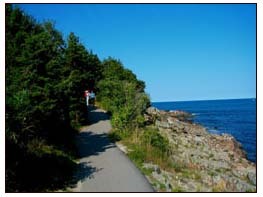 Many guests enjoy strolling along Marginal Way, which is a mile and a quarter long foot path that follows the shoreline from just on the other side of Perkins Cove north to Ogunquit Village Center. This walk is one of the most spectacular places to enjoy scenic views of the Atlantic Ocean and to watch the surf crashing against the rocks. Special offers are on our "Rates" page. 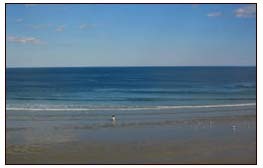 Ogunquit Beach is absolutely beautiful with three miles of white sand and natural dunes. As parking is limited at the beach we recommend that you enjoy a ride on the famous Ogunquit Trolley that stops in Perkins Cove, just across the footbridge. 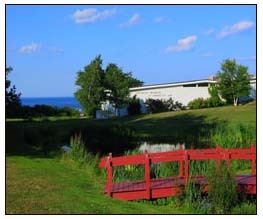 On the Trolley you can relax and enjoy the breathtaking sights that Ogunquit has to offer. Ogunquit has so much to offer you can spend a week or or more and never want to leave. But for those who love to explore… the nearby seaside villages and towns of Kennebunkport, Kittery, Wells, and York are all just a short drive away. 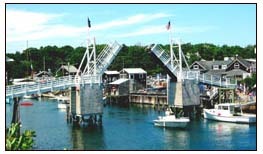 Some even like to use Ogunquit as "home base" and plan day trips to nearby Portland, Freeport - home of L.L. Bean or Portsmouth, NH. We hope to see you soon at the Riverside Motel – on the Cove in Ogunquit.